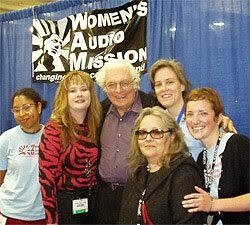 I last saw the famed Dr. Robert Moog, at the 117th AES Convention in October, posing with my friends from the Women's Audio Mission. Known for the synthesizer that bears his name, the electronic keyboard genius died at his home in Asheville, North Carolina on Sunday. He was 71. Moog was the inventor of the Moog synthesizer - whose variants have been used by everyone from Pink Floyd to Kraftwerk, Duran Duran, the Black Eyed Peas and the Neptunes - was diagnosed with inoperable brain cancer in April and had received radiation therapy and chemotherapy to combat the disease, according to a post on his official Web site. Born on May 23, 1934 in New York, Moog began tinkering with early versions of electronic instruments as a teenager. After writing an article about them in 1954, he opened a business building and selling theremins, machines in which pitch and volume could be controlled by the wave of a musicians' hand. Moog earned degrees in physics, electrical engineering and engineering physics before staring out on a path that would turn him into an icon for generations of modern musicians. By 1963, Moog developed the first widely used electronic instrument, a synthesizer, whose first popular appearance was on the Monkees album Pisces, Aquarius, Capricorn & Jones, Ltd.. The instrument had its breakthrough, though, in 1969 when musician Walter (now known as Wendy) Carlos had a Grammy-winning smash with Switched on Bach, an album of electronic versions of Johann Sebastian Bach pieces. Moog's synthesizers, which came with a piano-style keyboard, quickly became popular with rock musicians, who appreciated the wide range of unique sounds they could create by adjusting the various controls. Moog synthesizers appeared on the Beatles' Abbey Road and the soundtrack to Stanley Kubrick's "A Clockwork Orange." Moog reached a bigger audience in 1971 with his more portable Minimoog Model D, which had an even wider range of variations. His devices, which were heavily used by prog rock bands of the '70s, included the Taurus bass pedal synthesizer, which gave thick bass sounds to Genesis, Rush, U2 and the Police. Songs such as Donna Summer's 1977 disco hit "I Feel Love" were created almost entirely from Moog synthesizers, inspiring countless techno producers and artists of the 1980s and '90s. Though digital synthesizers would eventually replace the analog ones popularized by Moog, the warm, organic tones of his instruments were rediscovered in the 1990s by a wave of musicians who sought out the original versions, spawning tribute groups such as the Moog Cookbook and a movie, "Moog," in which artists including DJ Logic, Money Mark, Mix Master Mike, DJ Spooky and Yes' Rick Wakeman paid tribute to the inventor in the "Moog Documentary Clearly A Labor Of Love, by Kurt Loder". Moog had also recently worked with Roy "Futureman" Wooten of Bela Fleck and the Flecktones, on his "Royel" piano sampler. Musical collaborator and long time friend Seth Elgart had recently purchased Moog's fabulous "50th Anniversary Moog", to go along side his other vintage synths. He proclaimed it to be one of Moog's best creations. They, like so many others, will feel the loss of one of the greatest musical icons of the 20th century, and like the amazing Dr. Theremin before him, his dream will no doubt live on forever.